Last year, the Wyoming legislature was spared the agony of having to vote on big tax hikes. A Taxmageddon package that would have raised taxes by almost $500 million, died in the Revenue Committee just before the session. As I warned back then, it was only a delay. If nothing happened on the spending side of the equation, Big Tax would be back with a vengeance. To permanently remove the threat of higher taxes, we need structural spending reforms, spearheaded by real school choice. The Wyoming Center for Political Economy will work tirelessly to educate the people of Wyoming on the fiscal and moral virtues of school choice. We will do this, again, as part of an effort to permanently neutralize the threat of higher taxes. As we build our resources, we will also address other spending reforms, as well as regulatory reform. This new think tank is desperately needed. The threat from Big Tax is very much still alive, and that threat just became even more ominous. A September 25 report from Standard & Poor Global Market Intelligence reinforces the economic threat from big government. It has been ten years since the beginning of the Great Recession; in those ten years, government has continued to grow. A new recession - which we know will come - will not be gentler on the Wyoming economy. Widening federal budget deficits and a still-low federal funds rate imply that the economic and fiscal brunt of the next recession is likely to fall more squarely on the states. And given that states are structurally predisposed to the countervailing effects of pro-cyclical revenue trends and countercyclical expenditure pressures, they could be challenged as never before by the next recession. With the second largest government spending as share of personal income, Wyoming is way out at the wrong end of the "never before" spectrum. Bluntly speaking: if we add higher tax hikes to the picture, which will go into effect already next year, the next recession is going to be worse than anything we have seen in recent memory. 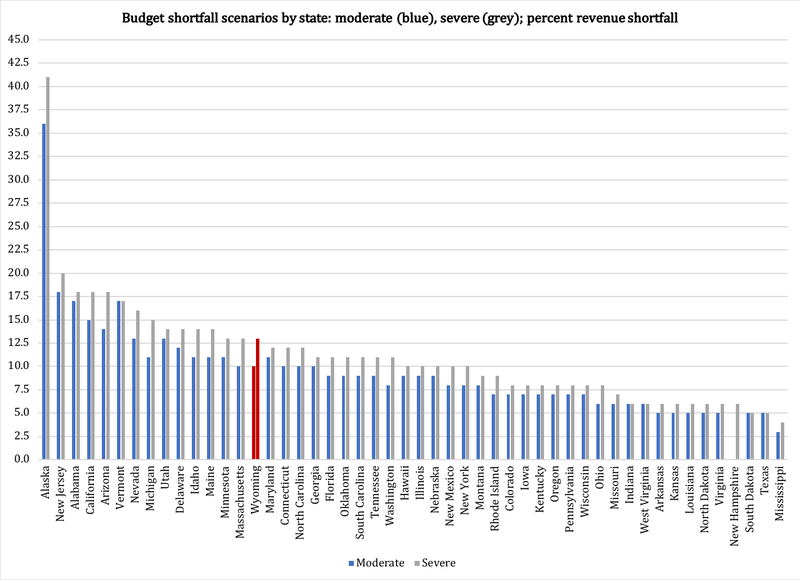 the states could experience a [revenue] shortfall of $71.1 billion, or 9.9%. We also considered a more severe fiscal reaction by the states in which the hypothetical recession triggered a larger revenue shortfall of $84.7 billion, or 11.8% of primary general fund revenues. By focusing on these tax revenues, the estimated revenue shortfalls may understate the exposure of certain energy producing states that levy severance taxes, such as Wyoming and New Mexico. These shortfalls exceed the 8.1% year-over-year real tax revenue decline that occurred between 2008 and 2009, reflecting changes in the states' revenue composition, in our view. In particular, the states' increased reliance on the personal income tax may contribute to the greater elasticity of state revenues to economic conditions. As a share of the states' combined primary general fund revenues, the personal income tax increased to 55% in fiscal 2018 from 49% in 2008. In other words, it is a bad idea to try to offset the volatility in severance tax revenue with the volatility in an income tax. And yet, that is precisely the direction in which Wyoming is moving. We also estimated the added fiscal strain from upward pressure on expenditures, stemming primarily from increased Medicaid caseloads. The unanticipated revenue shortfalls combined with the increased demand for social services that push costs higher are the fiscal shock against which we compared the states' budget reserves. 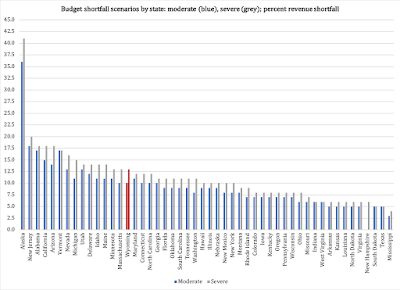 In the moderate revenue-shortfall scenario we are the 19th most vulnerable state. In the severe scenario we rank 15th. If we add the fact that tax hikes will likely go into effect before the next recession, our situation will only worsen. Higher taxes will discourage business activity, drive more middle-class families out of our state and depress, not strengthen, the tax base.